Software tools for interacting with the NTAG I2C plus Explorer kit board and demonstrate its features. To demonstrate the innovative features of NXP NTAG I2C plus via software tools included in the product support package. The NTAG I2C Explorer kit consists of HW and SW tools that developers can use to understand the NTAG I2C plus chip functionality and demonstrate its features and different use cases. Firmware update through NFC use case for the LPC microcontroller included in the Explorer board. Software was developed by following best practices to ensure readability and reusability, since these tools are included in the product support package. 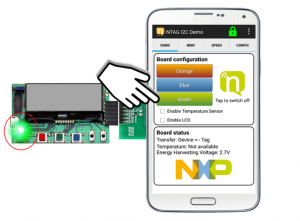 NTAG I2C Demo application, both for PC and Android, contains several tabs for demonstrating the different features and possible product configurations while interacting with the NTAG I2C Explorer kit. NTAG I2C Demo PC application was developed in C++ with a layered architecture using a PC/SC compliant USB NFC reader. It offers a high level API for easy reuse of high level functionalities. The Peek and Poke application for PC can be used to work with the NTAG I2C plus memory. We developed it in C# with a layered architecture, using a PC/SC compliant USB NFC reader to ensure modularity. It exposes a clear API to perform all memory functionalities. MobileKnowledge has also developed the embedded software in the Explorer board to demonstrate the firmware update through NFC use cases. This is C code for the LCP11U24 ARM Cortex-M0 microcontroller.